Would one of you retired knowledgeable fly tiers who has lots of free time on their hands upload a photo of where to find the outer covert and inner covert feathers on the bird wings. I think it would be helpful to others who are learning more about tying soft hackle / wingless wets / Yorkshire spiders. I think in this context that "outer" and "inner" just mean from the top of the wing and the underside of the wing, respectively. I think Bob is absolutely correct. Same goes for "upper" vs "lower" or "top" vs "bottom". 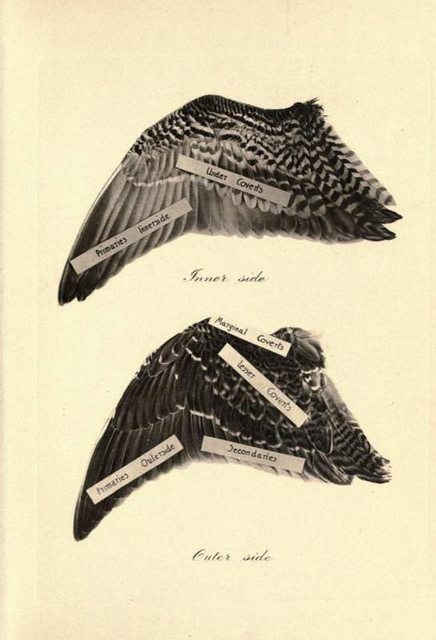 I spent the morning pulling out books and looking thru them looking for reference drawings showing the location of various feathers on birds. Here are some of the ones I found. Rob Smith's book has the clearest diagram, and extensive photos of the individual covert feather photos from rare birds. The best coverage I've found. The "Flympher" and "A Guide to North Country flies"did not have any feather diagrams in them, but are still great books. Anyway, I encourage others to pull out their books to see if there are other helpful references. Covert feathers = the small, rounded ones found near the leading edge (front) of the wing, both top and bottom. Hank - I reposted the last two links. Hopefully you can see the pics now. From Brook and River Trouting. Yup, now they are where they are supposed to be.